Place your open hand at the base of your throat, stretched across your collarbone. Holding your hand down, extend your neck up, leading with your chin and stretch with your bottom jaw, only, towards the ceiling. Do NOT swallow, but rather reach with your bottom lip towards the ceiling “looking” like a gulping fish. Make 10 “gulps”. Do 5 sets, changing hands for each round. One area of concern to many of us is the improvement of our necks. We either have rings around our necks, parchment-like skin, hanging skin, including the dreaded “turkey flap” or our necks just look “old”. Sometimes we feel our necks are too thick and others of us feel our necks are too thin. Carolyn’s Facial Fitness™ has worked hard to offer a combination of exercises that address all of these issues. When I was designing CFF™, I noticed that many of the facial exercise programs on the market did not address the neck or the décolleté. First of all, when I first started facial exercises, I had recently lost about 50 pounds. Not only was the skin hanging on my neck from the recent weight loss, I also had rings that had formed. As you can see in this neck exercise I offer here, I do not have even one line left and the skin in this whole area is smooth and firm. I’m 62 years old in this photo. In order to lift up the jaw line or even the hooded eyelids, my research indicated that I had to build the muscles in the front of the neck. Now, many of the facial exercise programs offered to do this, but at the expense of making the neck look too big and bulky. In the CFF™ program we devised a way to build the muscles in the front of the neck while giving the neck a trim and well-proportioned look. Not too bulky and not too thin. It’s the combination of exercises that target this area perfectly. Next, my concern was the lines and loose skin around my neck. While the skin did start to firm up with the toned muscles, the lines were still there. I was able to literally rub out these lines with the combination of exercises in the main DVD program along with the 3-step Wrinkle Release Technique, also part of the CFF™ system. It all worked! Take a look at Robert, too. He was also very successful in firming up and smoothing out his neck. Here is a great neck exercise you can try out and see for yourself how well it works over the next few weeks at eliminating lines and firming the skin! It helps to alleviate the deep rings that form around the neck as well as firm up the two long muscles that radiate from under the lips down to the top of the collarbone. A kind of “cording” can occur on the neck as we age and this exercise will both correct and prevent this from happening. 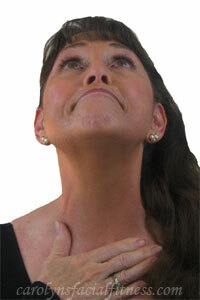 To see a facial exercise video clip of another exercise for the neck, go to “The Brush”. It is designed to firm the double chin and jawline, while erasing lines and minimizing cording in the neck, as well. Facial exercises are not a quick fix. They do require some maintenance. But, hey! 15 minutes a day, 3 to 5 days a week is a small price to pay for having more beautiful skin, less wrinkles, a firmer, more youthful-looking face and neck that keeps on getting better over time. Facial exercises help you to age gracefully and elegantly.